Your home can be a frontier: A place where retreat does not mean about-face departure but rather engagement and renewed focus. A space that is both wild and historical — where you free your soul and find your inspiration. It can be a place where horses run. The properties below embrace cultural heritage, living legacies and untamed nature — environments where you can go both deep and wide. They are vast, with views to forever and traditions rooted in the way-back, designed for the present. 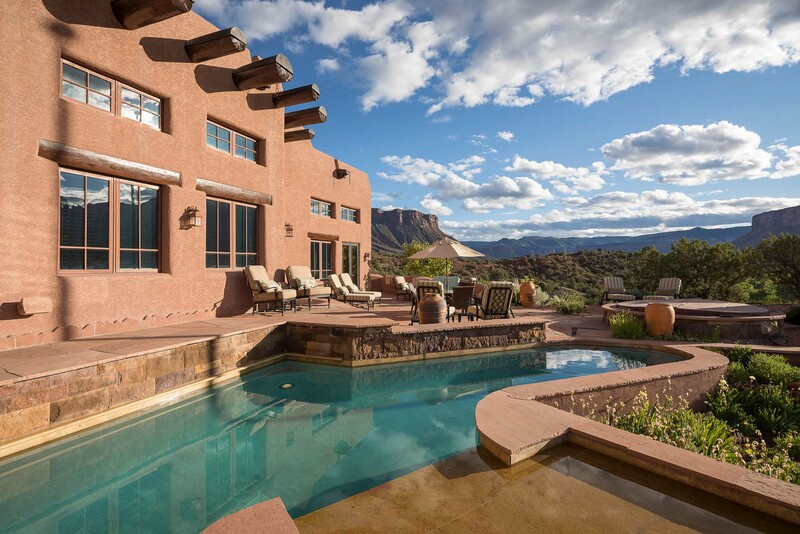 These are luxurious homes in rugged and rural places, with all the resources, access and amenities to provide year-round comfort and revelation — homes designed for hosting exploration and discovery. It began as one family’s dream to create a place where memories could be made to last a lifetime. It became a stunning residence and recreational facility on nearly 20 acres in a private Utah enclave. 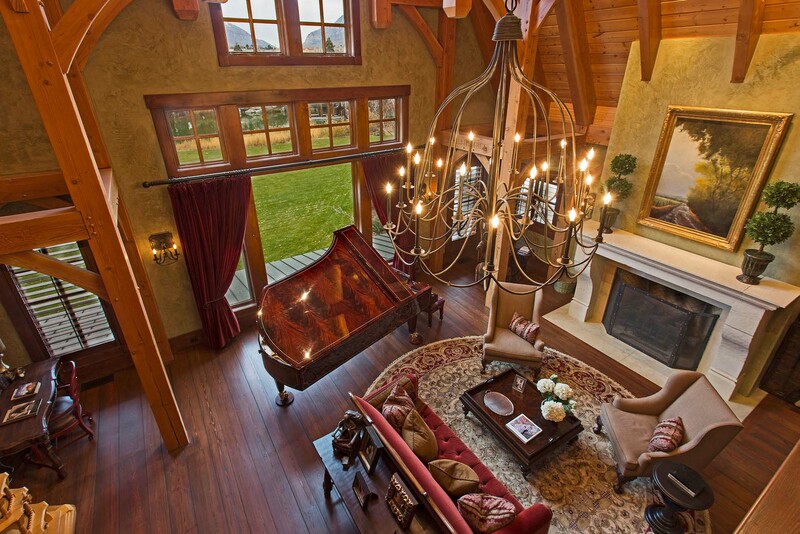 Situated between Utah Lake and the city of Orem, the property is its own microcosm. 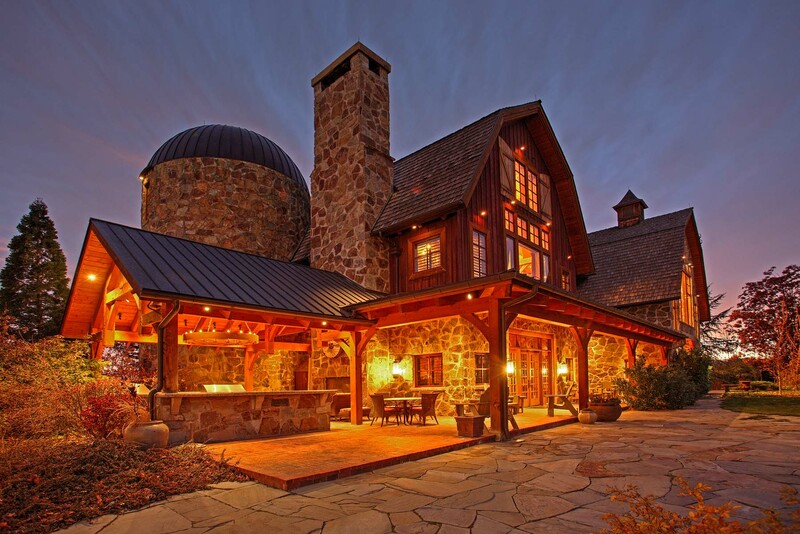 The main residence, a 20,000-square-foot home called The Barn, gracefully melds classic European design with an American Western aesthetic that reflects the area’s neighboring farms and history. It was built to the highest standards to last for centuries — European carpenters aided the construction. Some of the Barn’s highlights: timber frames; cathedral doors and ceilings; mountain views; a massive central fireplace; an indoor 3-D theater designed by Disney employees to feel alfresco; an indoor pub room with full bar, pool table and other parlor games; a private bathroom in every bedroom; highest-end features and appliances; a 1939 Bösendorfer imperial grand piano from a Vienna opera house; and far more, uniting luxury with fun. The property features an acre-large engineered pond (stocked with trophy-size fish), a boathouse (which includes changing/bathrooms and a lounge), a dock and boats. The outdoor swimming pool resembles an old rock quarry, with jump-off spots, an underground waterslide, multiple waterfalls, a hot tub, two water cannons, a kids’ pool and a secret passage into the rock face. It also has a garage and hotel-style guesthouse; a motocross course designed by an industry pro, with a state-of-the-art motorcycle maintenance shop that houses a wet bar and full lounge amenities (could be a stand-alone apartment); two fire pits among the trees; a storybook tree house with AC and heating; a zip line; a “little red schoolhouse”; a ball court; and Utah’s largest private grove of sequoia trees, which add privacy. There is also a gated and tree-enshrouded “secret garden” that is wrought-iron fenced and surrounds a 19th-century fountain from a European church. 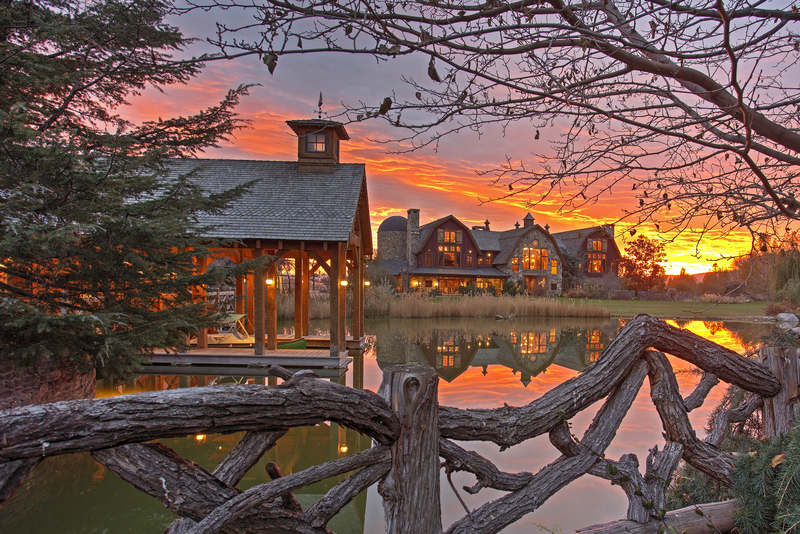 This estate can be the ultimate primary residence, vacation home or corporate retreat. Located a short distance from Brigham Young University, it is 20 minutes from Sundance Mountain Resort and less than an hour from Salt Lake City and Park City. 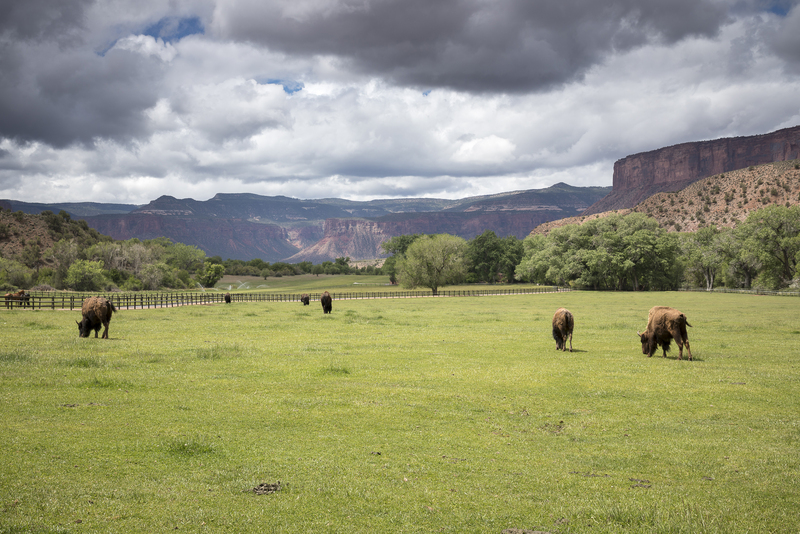 One of the most significant listings in the American West, West Creek Ranch is a spectacularly diverse private land and estate property boasting one of the finest residences and environments in the world. Located in Mesa County, Colorado (approximately 6,412 acres), and in Grand County, Utah (approximately 507 acres), the vast property encompasses four parcels of unique land formations, including the soaring Precambrian rock-cliff walls of Unaweep Canyon and magnificent views of Utah’s La Sal Mountains. 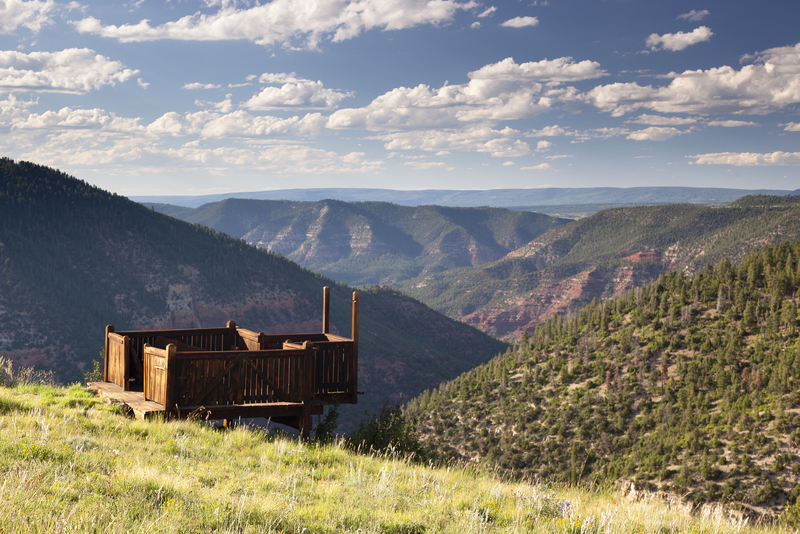 Together, the residential structures of West Creek Ranch (including the main residence, guesthouse, stables and Sky Mesa cabin) contain a total of 14 bedrooms, 12 full baths and two half baths. 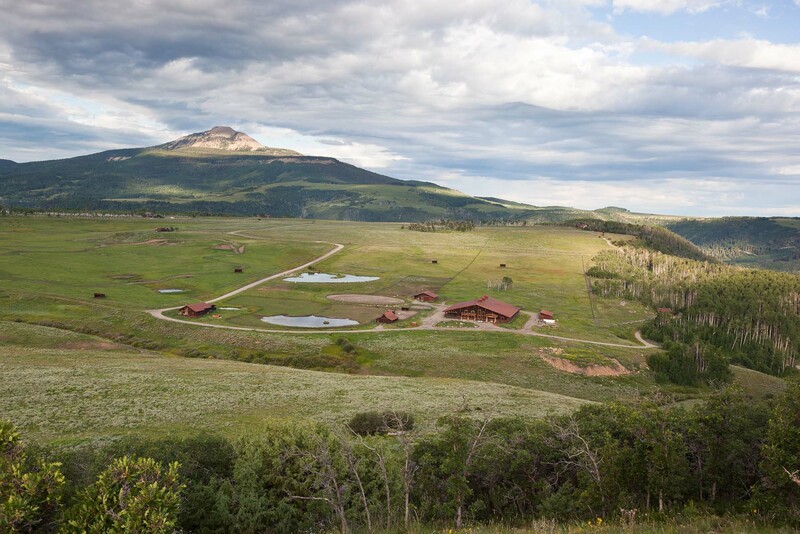 On-ranch treasures include a bear and mountain lion habitat, genuine dinosaur footprints and the historic ruins of Driggs Mansion. The main residence features exquisite finishes and craftsmanship throughout more than 22,000 square feet of indoor living space that contains an 800-pound-capacity elevator servicing all four levels, a great room, formal dining room, breakfast room, chef’s kitchen, spacious study with panoramic views, art studio, theater room, game room, gym, staff quarters and pool and spa, plus four water fountains, six fireplaces, a two-level circular stone library, interior marble archways and columns, and modern geothermal heating/cooling. Also included are an emergency power generator, irrigated equestrian and bison pastures, fishing ponds, a trout stream, a grass airstrip and hangar, a helipad, a five-car garage, stables and an astronomical observatory. 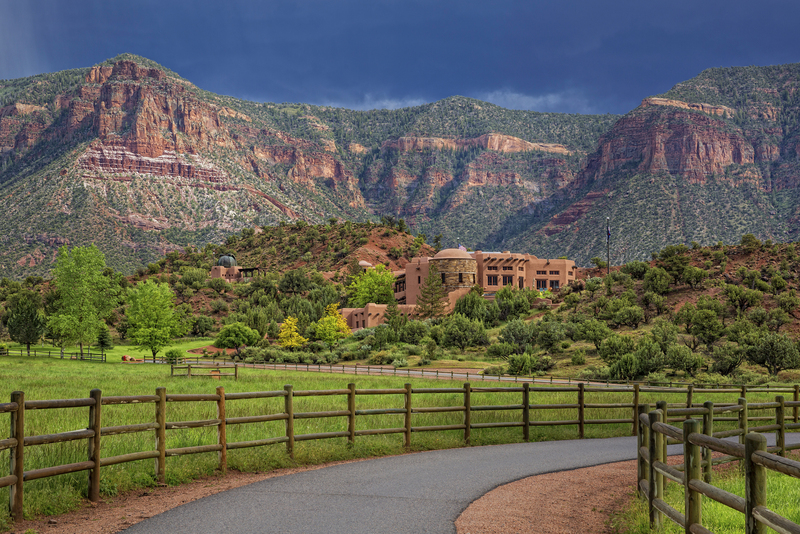 West Creek Ranch is conveniently accessed by nearby Grand Junction Regional Airport and is close to Gateway Canyons Resort, voted in 2016 by “Travel + Leisure” readers as the “Best in the West” and by “Condé Nast Traveler” as the Top Resort in Colorado and third Best Resort in the U.S. The estate and the four distinct land parcels included in the sale are a collection of some of the most enduring and treasured natural geological wonders in the canyon lands of the American West, which, surrounded by natural, open space, will be preserved for years to come. 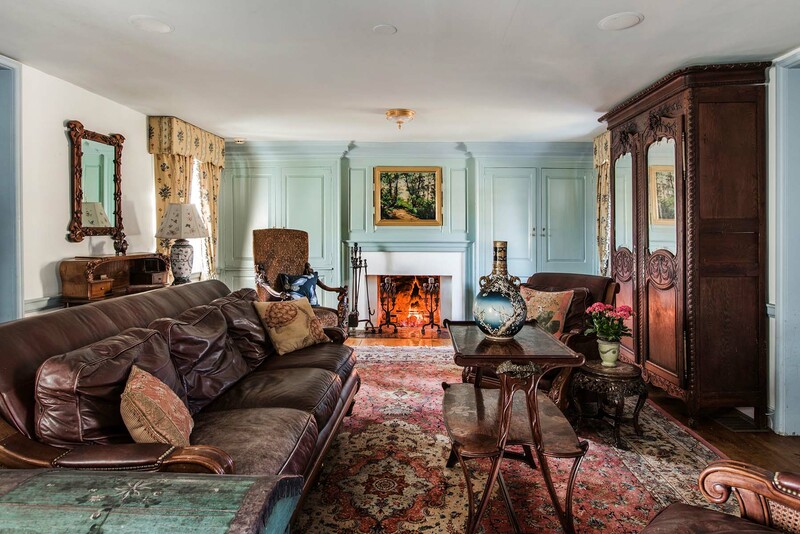 Elm Grove Estate is one of Bucks County’s most legendary properties, having been a center of wealth and hunt-country heritage for hundreds of years. Offered outside the Paxson family for only the second time since 1680, this 75-plus-acre estate was part of the Colonial province of Pennsylvania. The property began with a stone settler’s cottage and grew to include a circa 1700 stone manor house with later additions, a carriage house, barns, workshops and extensive stables used by the former owner. Well hidden behind a long, ivy-covered stone wall, the main house, outbuildings and the surrounding preserved countryside feel like an English estate. 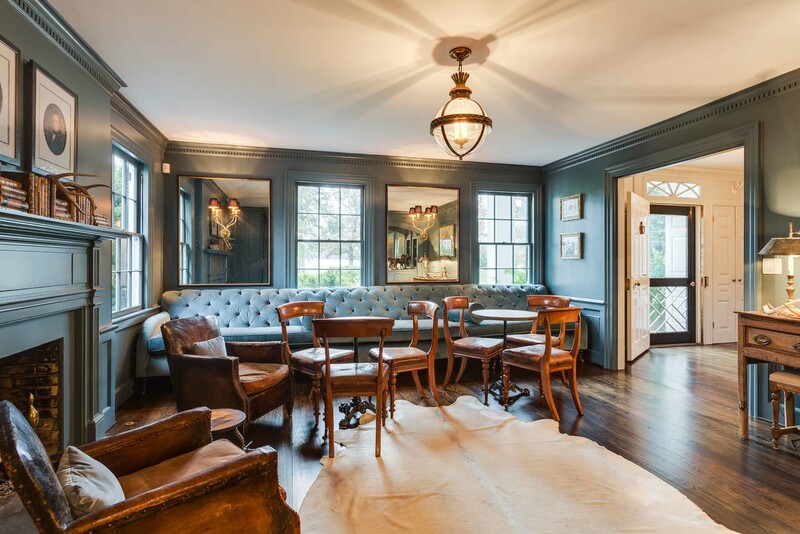 This property underwent extensive restoration and updates during the past 15 years, preserving its architectural details and manor-house proportions while also enabling it to serve as a comfortable family residence with modern amenities. Built in three sections dating to 1700, 1739 and 1938, the main house is approximately 8,601 square feet. There are 10 fireplaces, high ceilings and a bounty of tall sash windows for great natural light. 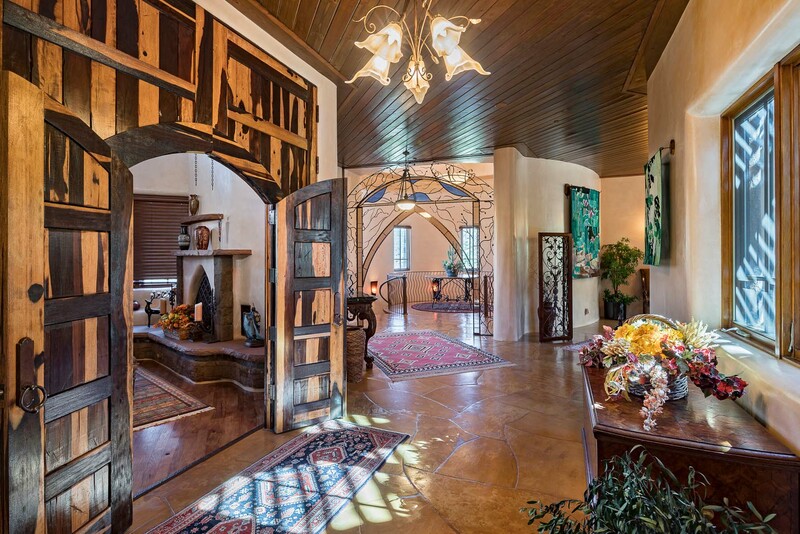 Its wide main entry hall is flanked by an intimate, formal reception room, the hunt room with walk-in fireplace and superb views, and an expansive formal living room that accommodates multiple seating areas and accesses a large rear patio. Throughout its history, this home has hosted grand-scale events. 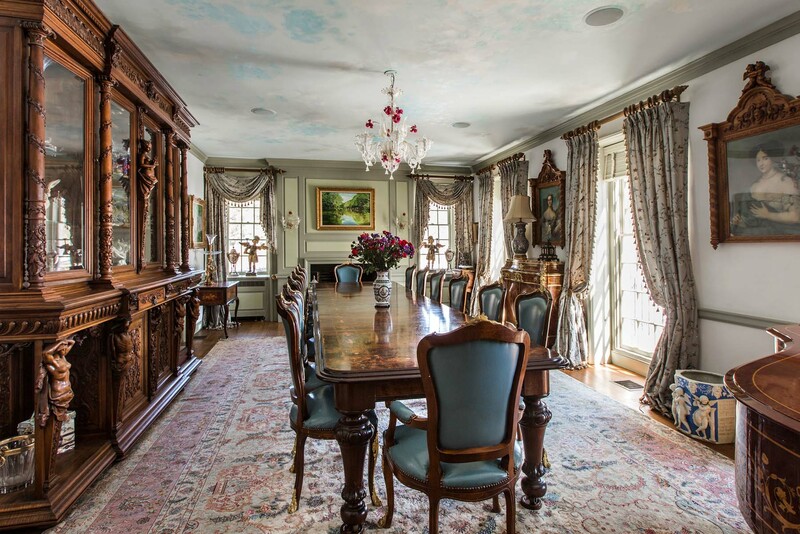 The addition completed in 1938 contains an exquisite, formal, mansion-size dining room with a hand-painted ceiling and tall Jefferson windows with stunning views. 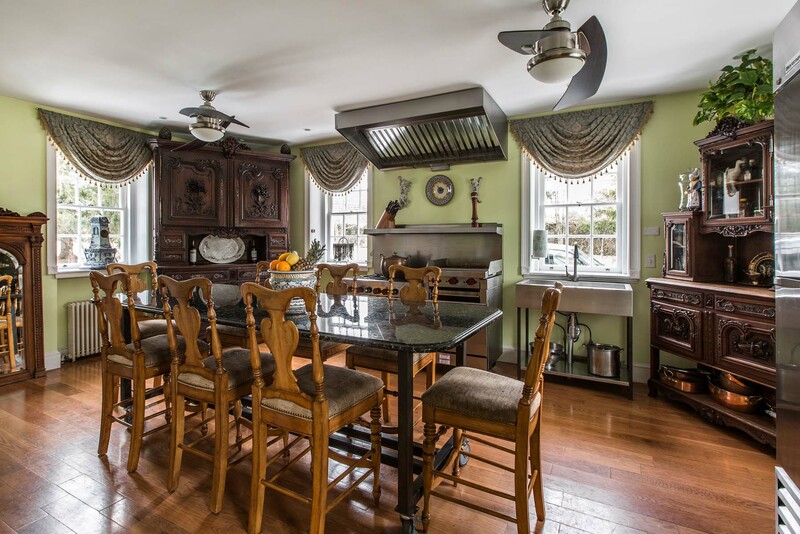 Serving this area is a butler’s pantry and a true commercial-grade kitchen. Above are two floors of private quarters along with a library. The carriage house is updated and offers complete, character-filled living spaces, with storage below. The house and dependencies overlook verdant, level fields with a stream, pond and forested hills beyond. Enchanting on a misty morning and as the night sets in, Elm Grove is a prime property that’s ready to add a new chapter to its long and storied history. 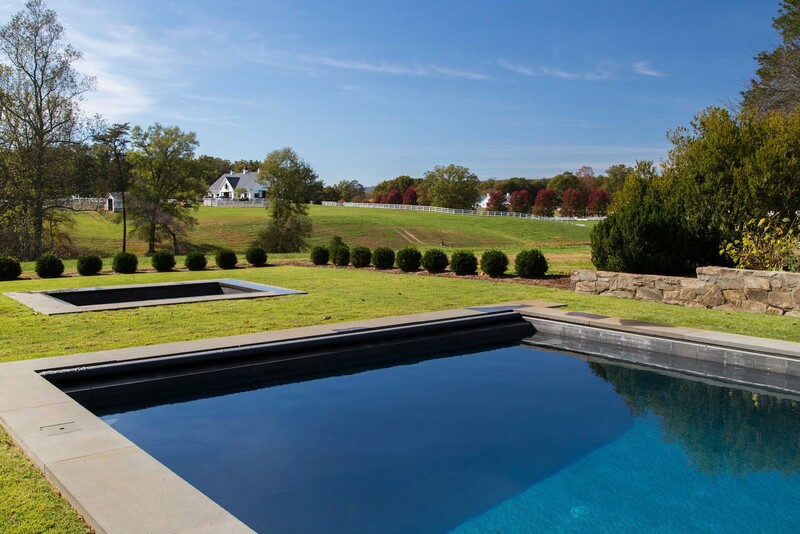 On 200 acres of gently rolling, lush pastures, Eldon Farm is a one-of-a-kind country estate in the heart of celebrated equestrian territory Keswick, Virginia. 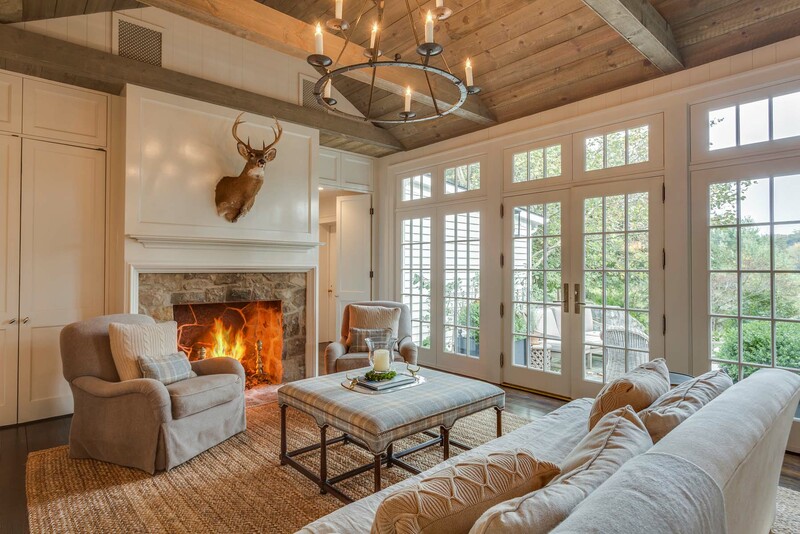 The estate’s multiple houses and barns have been meticulously renovated in keeping with its Virginia surroundings and European style by the current owners and renowned interior designer Jeannette Whitson, from Nashville. 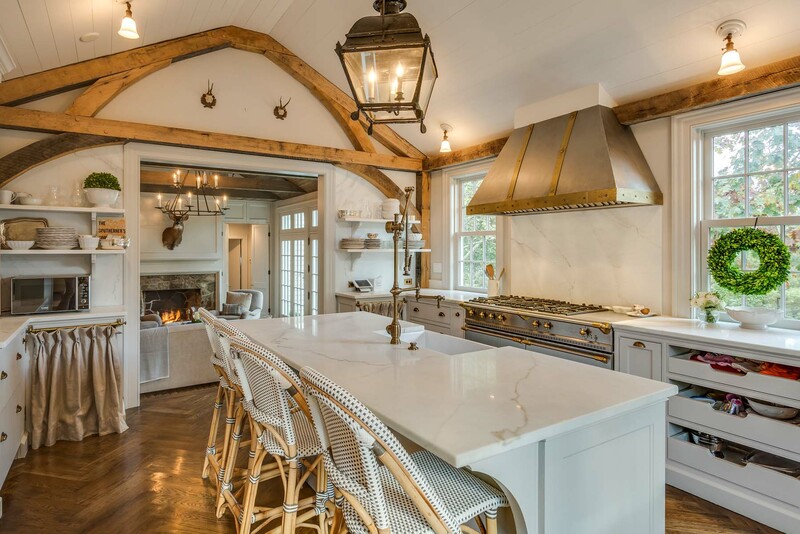 Loving overhauls and new builds on the property include the main house, guesthouse, caretaker’s house, hunter barn, show barn and pool — all of which fuse tactile rustic with modern ease. The main home, built in 1940, features exposed-wood-beam ceilings, multiple fireplaces, exquisite Farrow & Ball wallpapers and paints, Carrara marble and Waterworks fixtures in all baths, and a Lacanche Sully dual-oven cooking range (with custom hood) and Sub-Zero and Miele appliances in the kitchen (plus a kitchen-side terrace with a custom-made Grillworks titanium wood-fired rotisserie grill). These and endless small flourishes mark a place designed to comfort and function with exacting precision. 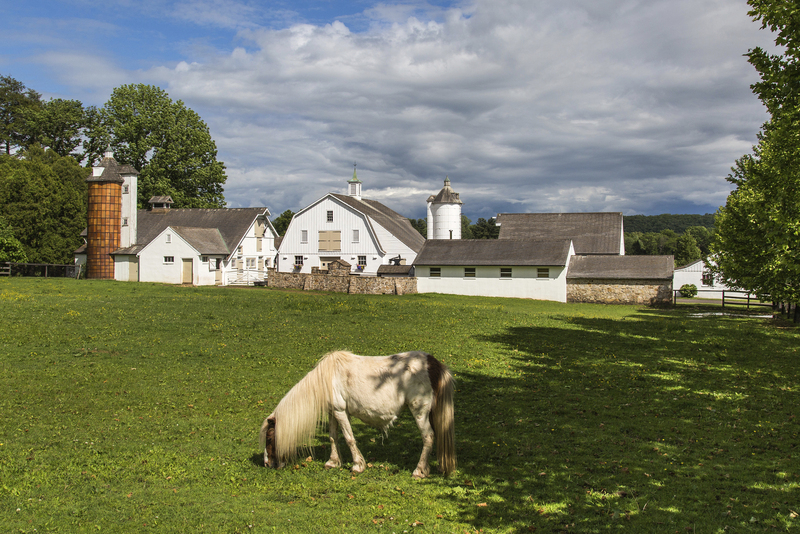 In an area known for horse farms, Eldon Farm is an equestrian haven like no other. Along with its state-of-the-art barns, the extensive fencing throughout the grounds has been fastidiously maintained, and the property structures are equipped for both guests and business: The show barn, for instance, features a second-floor office and apartment, including a bath, large kitchen and bar above working ground-floor stables and two more offices, plus a trophy room (that can double as a conference space), a laundry room and a full equestrian lab — alongside a large outdoor riding arena. All stall and barn hardware was made by world-famous Lucas Equine Equipment. Two barns have backup generators, separate storage buildings (for tractors, hay or shavings), individual wells and watered paddocks. Only a 25-minute drive from Charlottesville, Eldon has a painting-perfect tree-lined driveway that leads the way into its sprawling lawns, etched by natural features such as a year-round stream, two ponds and shade-tree stands. It also has classic-modern structures: a grand white trellis; a new, elegant 60-foot-long bluestone saltwater pool with a sun shelf and automated cover; and an oversized hot tub. 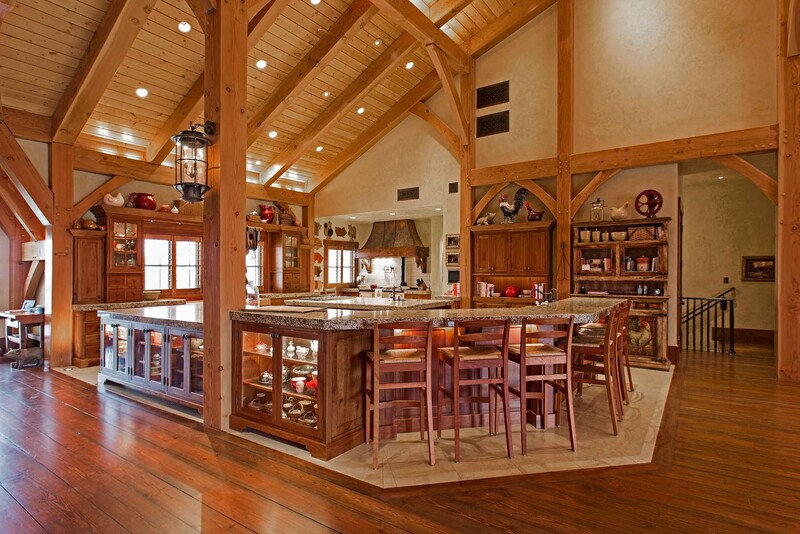 This is a place for lovers of horses and extra-fine and functional country living. 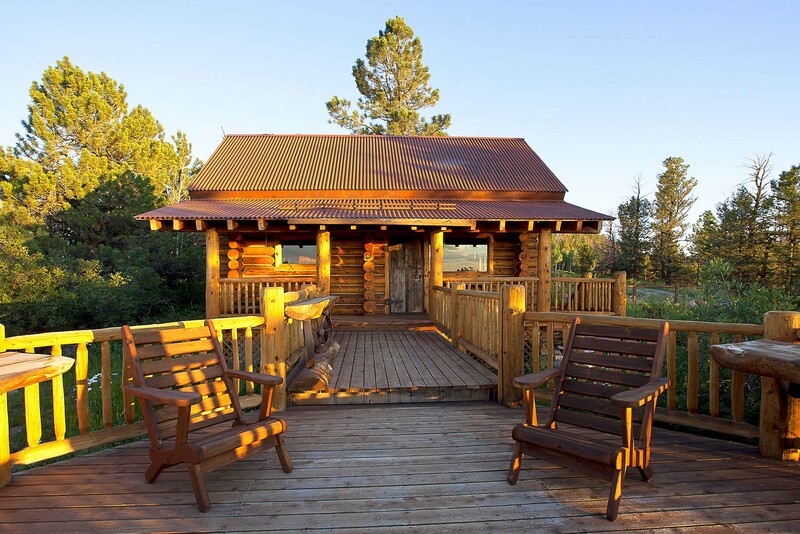 The Berman Buckskin Ranch is one of the finest recreational properties in the Rocky Mountains. 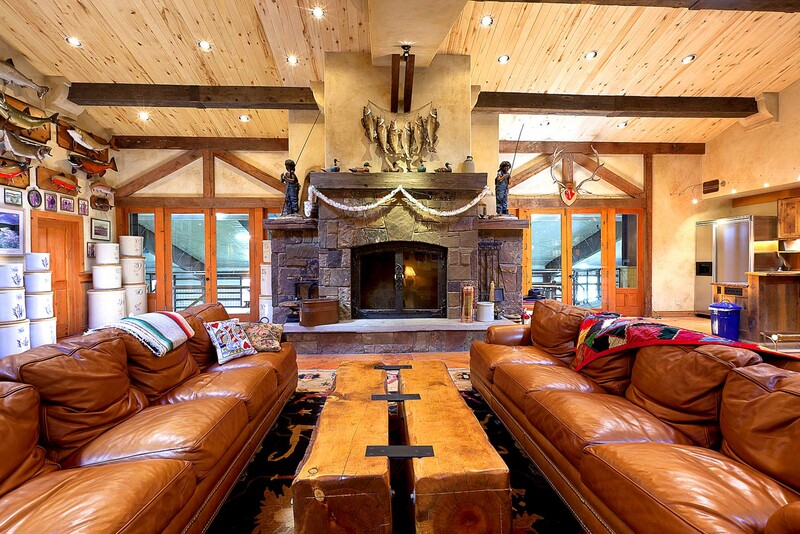 Located just 13 miles on year-round roads from the legendary resort town of Telluride, this ranch retreat offers everything outdoor-sports and nature lovers with fine taste can imagine. The spectacular property was owned for generations by a regional ranching family until it was acquired by Hollywood producer Oliver Stone. 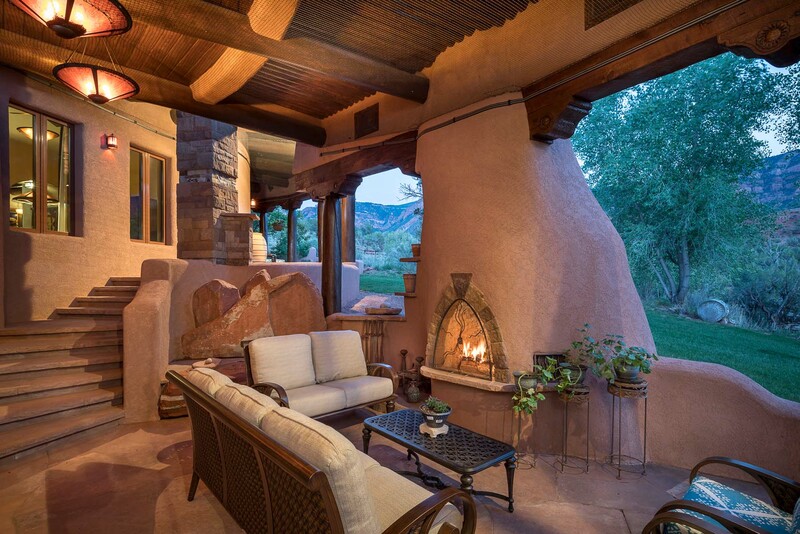 Both Mr. Stone and the ranch’s present owner, gaming mogul and poker legend Lyle Berman, invested tens of millions of dollars in residential, recreational and equestrian improvements to the property, which has entertained scores of celebrity guests. Most recently, the equestrian facilities were used to train members of the cast for Quentin Tarantino’s The Hateful Eight. The main house, commissioned by Mr. Stone, was featured in Architectural Digest. It is a contemporary version of a western ranch home, featuring soaring windowed spaces that frame the dramatic surrounding views from varied levels and vantages. 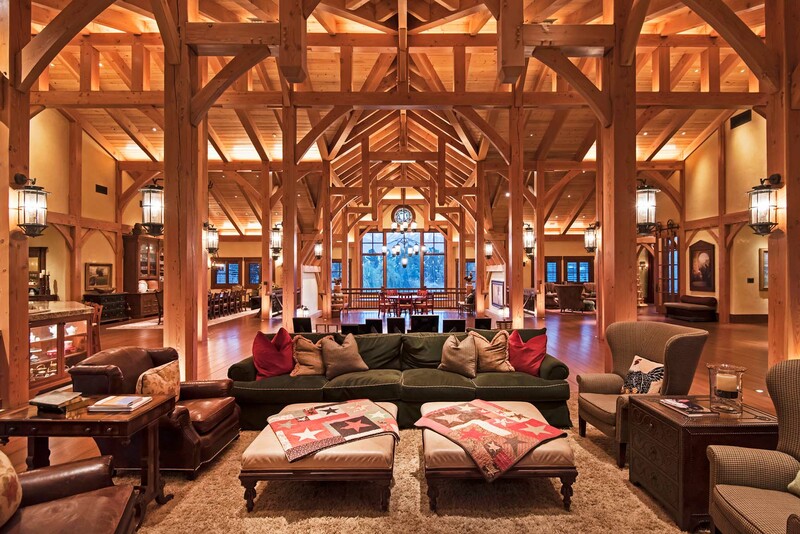 The spaces are accented with clustered columns of steel and timber and the home’s great room is the place to congregate around a towering stone fireplace. 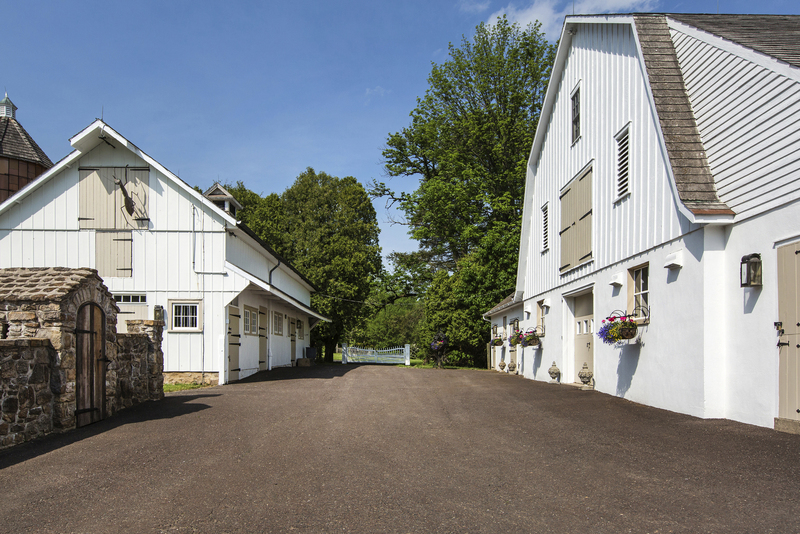 The home and extensive outbuildings have been further expanded, updated and customized by Mr. Berman. 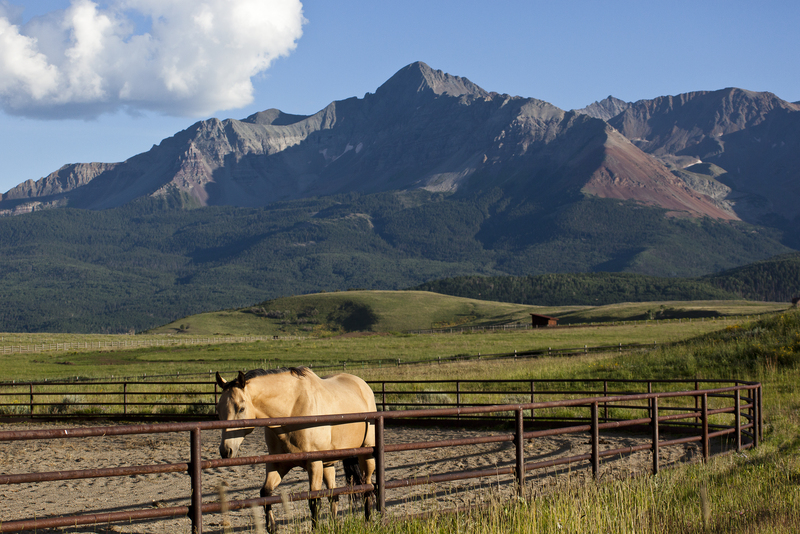 Along with its extensive grazing pastures, rolling flower-filled meadows, aspen forests encircled by 14,000-foot mountains (including the iconic Wilson Peak), and miles of private trails for hiking, biking, and snowmobiling, the ranch is a horse enthusiast’s dream. Its 32,000-square-foot equestrian facility offers a world-class 24-stall barn, indoor riding arena, paddocks and extensive corrals specifically designed to house and show horses, along with a top-of-the-line vet facility to care for animals in-house. The property has two stocked fishing ponds, rich with cutthroat and brown trout, that have been carefully maintained for years and offer all-season angling. There is also an Olympic-quality sporting clays course with multiple stations for trap shooting. The nearby historic town and ski resort of Telluride, Colorado, is recognized worldwide for its stunning alpine beauty, sophisticated charm, boundless recreational activities and the internationally important Telluride Film Festival.